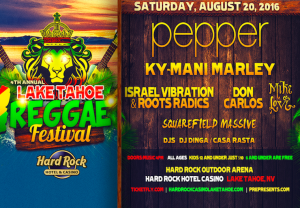 If you need to change your latitude this summer and can’t get away to the Islands, the Lake Tahoe Raggae Festival at the Hard Rock Casino may be just the ticket when you visit Lake Tahoe. Two of the bands this year have Hawaiian roots: “Pepper” hails from Kona and comes to us by way of San Diego. Mike Love is from Oahu. Ky Mani Marley and Don Carlos are both from Jamaica. Each vocal group reflects their heritage and provides a good variety of musical styles. “Israel Vibration” has a traditional sound with an excellent tune called “My Master’s Will” that I really enjoy. There is sure to be something you will enjoy and the live music festival in South Lake Tahoe. If you are in Tahoe, everything is going to be alright! Lodging suggestions: Four star lodgings are available at Harvey’s and Harrah’s right next door or the Marriott Timber Lodge Resort is one block away.